Basil plants come in a large number of varieties– from sweet basil to Thai basil to lemon basil and Genovese, to name a few–but taking care of a basil plant remains one of the simplest tasks in gardening. The hardest thing to do with a basil plant is to control how big it gets; but just keep cutting it and using it to season your favorite foods and you'll be fine. Basil is happiest when it is in full sun and growing outdoors, but it can be grown inside as well as long as it is close to a sunny window or plant growing lights. Plant in a sunny section of your garden in nutrient-rich soil. Give your basil plant adequate water each evening as the sun is going down to prevent burning the leaves. Check your basil daily for pests and disease and treat, if necessary. Cut back the stems as they get to be longer than 9 inches. At each cut, the plant will grow new shoots, cut these when they get large enough. Dig up your basil as the cold weather approaches and plant it in an adequately sized planter to allow it to continue to grow inside over the winter. Place in a warm, sunny window–a southeastern facing window works best. Test the soil each day by digging down into the pot a few inches with your finger to see if the soil is dry. Water frequently, but allow the soil to get fairly dry between watering sessions. If you see your plant starting to wilt, water it immediately–it will come right back again. Put the plant and pot into a large sink or bathtub and gently run water into the pot allowing it to completely saturate the plant and flush away any stagnant water that may be in the soil. Do this once a month, letting the plant drain for several hours. Keep your basil trimmed to a manageable size for your indoor purposes by cutting the plant's stems between leaf sets. Plant your basil back into your prepared garden in the spring and continue caring for it and reaping the benefits of fresh herbs. It is not usually necessary to fertilize basil as most herbs do not need as much of the nutrients that can be found in fertilizers. 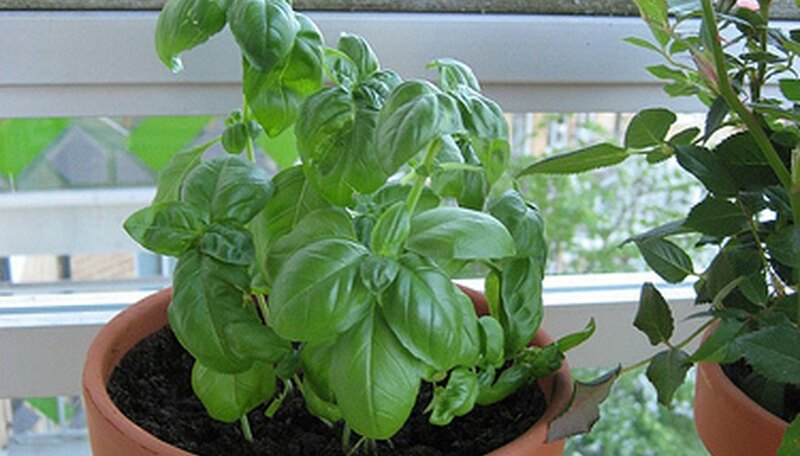 Re-potting your basil in good, nutrient-richsoil each winter and spring should be enough to carry it through.